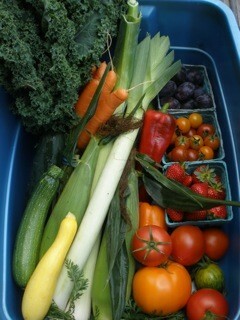 Fresh, Local Produce Direct from Farm to Table! Abby’s Greens - Apples - Artichokes - Arugula - Asparagus - Beans - Beets - Berries - Broccoli - Cabbage - Carrots - Cauliflower - Chard - Chiles - Corn - Cucumbers - Fennel - Flowers - Herbs - Kale - Leeks - Lettuce - Onions - Pac Choi - Parsnips - Peas - Peppers - Plums - Potatoes - Spinach - Squash - Tomatoes - Zucchini ... & more! Sign Up for the Upcoming Season Here! Based on the community supported agrigulture (CSA) model, the Harvest Basket program is a partnership of mutual commitment between our farm and you, a local eater. Harvest Basket members sign up for our 28-week CSA season and in return receive a diverse array of vegetables, fruit, berries and recipes each week from June through December. How Many People Will a Harvest Basket Feed? It depends on your eating habits, but most members say that a Harvest Basket is ample produce for two to four enthusiastic veggie eaters who mostly cook at home. A few especially zealous folks have managed a whole basket themselves - they do a lot of freezing, juicing, and preserving - while others have split it 6 ways. 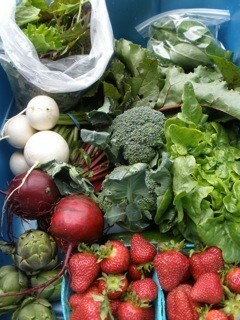 What's in your harvest basket follows the arc of the season, so a weekly share in June might include: 1 pint of strawberries, 1 head of lettuce, 1 head of pac choi, 1 bunch of radishes, a pound of broccolini, a few stalks of rhubarb, 4 artichokes and a pound of asparagus. A weekly share in September might include: 1 head of lettuce, 3 sweet peppers, 2 hot peppers, 1 pint of berries, 1 bunch of carrots, 1 cucumber, 8 ears of corn, 3 lbs of potatoes, 1.5 lbs of tomatoes, 2 zucchini, 2 bulbs of fennel and 1 bunch of herbs. Shares are often smaller in June and early July, but larger in the late summer and fall when the harvest is at its peak. The value of the Harvest Basket averages around $30 per week but fluctuates with the season. A basket in early June might be worth $25, whereas a basket in late August might be worth close to $50. We have two payment options described below. We accept cash, checks, PayPal and SNAP benefits. In a typical year, you receive about 10-15% more produce than you pay for over the course of the season, making the Harvest Basket the best value for your dollar. Salad, Flowers & Tamales, Too! Abby’s Greens Salad Share: A seasonal mix of lettuce, Asian greens and flowers available for 20 weeks, June through October. $190 - 1-pound/week share; $100 - 1/2-pound/week share. Juana's Homemade Tamale Share: The tamales are fresh-made by an employee's sister at her commercial kitchen, then quick-frozen for delivery to your pickup site. Your choice of various fillings: vegetarian, meat, or a sampler. One dozen/month for 7 months: $150. We have an online signup process via our website. We offer returning members a prioirty sign-up period in January/February to guarantee them a spot for the upcoming season. For folks on our waiting list, sign-ups begin after the prioirty period in February/March. Sign up here for the upcoming season. How Do I Get My Share Each Week? When you sign up with us online, you choose a pick-up site with designated pick-up hours. We have pickup locations in downtown Coos Bay, Bandon, Port Orford, and at the farm in Langlois. Each week we’ll harvest and pack your produce into re-usable totes on the farm and then deliver to your pick-up location. You come to the pickup site with your own bag, unpack the tote's contents, and leave the emptied tote at the site. If you are sharing a basket with someone, it’s your responsibility to divvy up the basket with your share partner each week (we do not offer half shares). If you know that you’ll be out of town, we suggest that you arrange for a friend to pick up your basket, or notify us so we can either hold your share in our cooler at the farm or arrange to donate it to a local foodbank. Any unclaimed shares at a pick-up site will be donated after 24 hours. Why Would I Want to Sign-Up for a Harvest Basket? 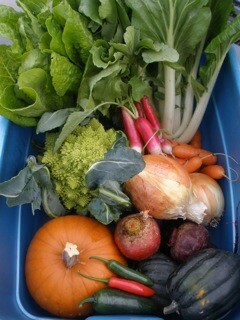 The Harvest Basket is the most affordable way to get fresh, farm-direct, local produce from Valley Flora. We honor the seasons and harvest everything at its peak of ripeness and flavor. We help you enjoy the diversity of farm produce with a weekly newsletter and recipes that turn unusual (and sometimes intimidating!) foods like kohlrabi and fennel into a culinary adventure. Harvest Basket members are also always the first to know when certain crops like strawberries, tomatoes, plums and other produce is available for u-pick or bulk purchase on the farm. Your financial commitment to the farm in the spring - when money is always the tightest - helps us afford seeds, soil amendments, and labor to get the season going - and provides financial stability throughout the year. Our Harvest Basket members become friends, create new community, and act as vital partners in realizing a vision where local food, family farms, and sustainable agriculture are the thriving norm in our neighborhood. Everything we eat from you is so delicious. You must be doing something magical. The food is full of it! THANK YOU to everyone at Valley Flora for the most wonderful harvest baskets all summer long -- every Wednesday pickup is full of delight and amazement! This past week's delivery was to die for!!! And now that tomatoes (real, tasty, delicious tomatoes) are starting to come in, my husband and I are in heaven!! He made an awesome potato, leek, carrot and bacon (carnivore that he is!) soup this past week that was wonderful. And the tomatoes --- yum!! And with basil coming again, life is so good! 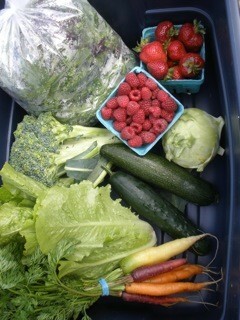 Thanks to you all for your hard work and for bringing us these wonderful (and healthy) treats! I just have to thank you right now this minute for the best carrot I've ever had, ever. It's the one that's orange on the inside and beet colored on the outside. It was SO sweet and SO pretty and just so much fun to eat. Thank you! 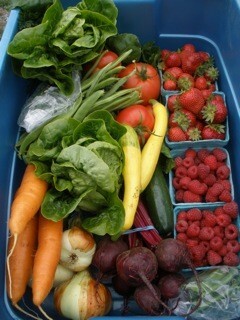 I think need a bumper sticker that says - "I 'heart' my CSA!" You guys are awesome and I thank you every time I open my fridge. You are changing my eating habits & I feel so much healthier! I've even lowered my prednisone dose, in part due to healthy food. Thank you Valley Flora! 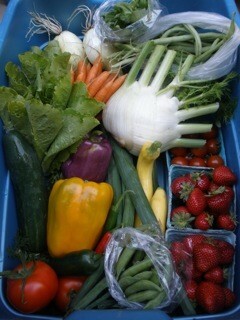 Just have to say -- we totally love Saturdays when we get your awesome delivery!!! It's like a Christmas present every week!! When we decided to commit to doing this, we had to say -- okay, now what menus do we work around this wonderful produce/veggie delivery. And it's working!!! Thank you, thank you!! It's great and so much fun!